Laptops tend to squeeze all USB ports on one side and allow just a tiny millimeter of space in between ports. It’s okay until you try to insert chubby USB flash drives and you realize they won’t fit in. So what SanDisk came up with is a slim USB stick that won’t block other ports; however, it seems like SanDisk forgot some of the more important aspects a user would need in a USB. SanDisk Corporation, the world’s leading provider of flash storage cards, introduces the SanDisk Ultra 32 GB Flash Drive, a new USB 2.0 device that swears to deliver high storage capacity, data protection, and speedy data sharing. The overall appearance of the SanDisk Ultra 32 GB Flash Drive resembles a finger and offers a slim design perfect for tight USB ports. It is kept in a red and black color scheme and sports a capless design with a retractable USB plug at the back of the drive. However, the SanDisk USB is encased in a plastic material that seems a little vulnerable. So yes, the SanDisk is not rugged enough and might not be advisable for constant travelers. But then again if you really want to carry it around, there’s a hole at the tip of the drive easily fits a keychain or a necklace strap to provide an alternative handling option. Another downside is that SanDisk can only offer USB 2.0 for this device. So even if it has 32 GB of storage space, it transfer rates are slow. While you the 32 GB capacity allows storage of about 1800 photos, 80 minutes of videos, 2000 mp3 songs and about 8 GB of office files, it can only enjoy up to 10 MB/sec write and 15 MB/sec read speeds. There’s even a 64 GB version available in some stores. Nonetheless, it offers compatibility for Windows XP, Windows Vista, Windows 7, and Mac OS X10.5 and higher. 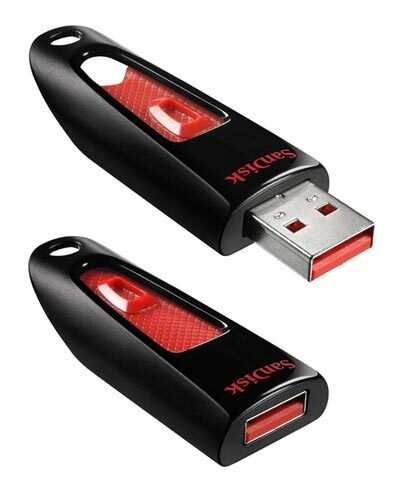 However, the SanDisk Ultra USB Flash Drive is a plug and play device. It includes the SanDisk SecureAccess software that password protects and encrypts your private files using a 128-bit AES encryption. At $42 you can grab this 32 GB USB drive and enjoy a guaranteed 5-year warranty from the date of purchase. Professionals might think twice about using this device because while you can enjoy storing as much as files as you can, you might end up waiting in vain when you try to transfer them. What’s your verdict for this USB device? Don’t forget to share your thoughts! This entry was posted in Articles, SanDisk, SanDisk Corporation, USB Devices, USB Flash Drives and tagged 32 GB USB drive, SanDisk Corporation, SanDisk Ultra 32 GB Flash Drive, SanDisk Ultra USB Flash Drive, SanDisk USB, slim USB stick, USB device. Bookmark the permalink.